She sure did --- in my dreams last night! And not only that - but I also went camping with Fred McMurray! I watched a little TV in bed last night - Antiques Roadshow FYI. They had a segment about Debbie Reynold's son, Todd Fisher, who heads her archives of vintage Hollywood costumes. It was fascinating to see what she has collected and preserved over the years - right down to a pair of Dorothy's Ruby Red Slippers from the Wizard of Oz! Now there were no costumes shown of Phyliss or Fred's - they weren't even mentioned, but that's just how crazy my life is lately! We are suddenly getting more showings of our house! We had one Monday and have another one tonight at 5:00. A total of four people contacted our realtor over the weekend, so there are two more to go! It's exciting, but very emotional waiting to hear if anyone will make an offer. And unfortunately, this means I can't spend any time in my studio on current projects, so I still have nothing to show you. But you don't mind as long as we're getting our house shown, do you? I also want to help spread the word that Amy of Park City Girl is having another Bloggers Quilt Festival! If you participated in the last festival as I did, you know how much fun it is! If you haven't been over to visit Amy, please do! I'm still trying to catch up with blog reading - it's been pretty busy at work this week. The good news is that my new monitor is scheduled to arrive today! I'll be setting it up later this evening after the showing, so I won't be participating in this week's Vintage Thingie Thursday. If you get a chance, though, please visit Suzanne at Colorado Lady tomorrow for all the great VTT posts! After last weeks folly of thinking Thursday was Wednesday, I'm back on track with a VTT post at the right time! Don't forget to go over to Suzanne's at Colorado Lady for all the other great Vintage Thingie Thursday posts! Mr. Squash and I love antique oak furniture! 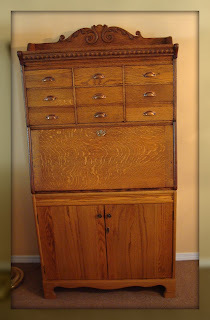 Most of our furniture is oak - many pieces are antique. 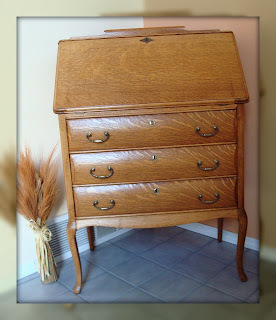 Today I'm showing you our two antique oak secretary's. The first one Mr. Squash got many years ago. It was found in a barn with only the top and was quite black with dirt, grime and stain. He refinished it and had the base cabinet built to coordinate with the top. 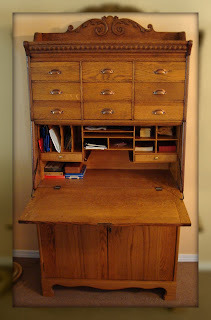 Here is the secretary in its open position. I love it for all of the cubbies and drawers! 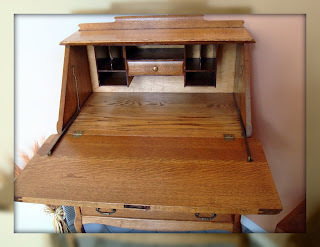 The Queen Anne style secretary below was purchased a couple of years ago from a small antique dealer we really like. Times are so hard for independent dealers right now. We were quite happy to give him this sale! This secretary sits just inside of our front door. The wheat bundle on the floor next to it is the only little decoration our realtor would let us keep for showing! Here it is open....during the holidays I like to dress it up! At Halloween I have a quirky "pumpkin tree" that sits on it along with other Fall decorations. At Christmas I put a whole bunch of holiday village houses on it with "snow" under them. When they are lit, they look so pretty through the window! This year with the house being on the market it will have to stay empty - I'll miss my decorations! Would you believe I thought this was Wednesday? I just sat down to post and realized today is Thursday!! Sorry for the late post, but with a four day work week, I got a little mixed up! Don't forget to visit the other great Vintage Thingies over at Colorado Lady. This week I'm showing you Mr. Squash's collection of World War II posters. He loves WWII history as well as collecting the posters! This first one is our favorite! It hangs next to the dining room table. Anything behind glass is difficult to photograph, so some of these wound up on the floor for a better picture! This is huge and hangs in our entryway. I've been planning a 4th of July quilt to hang near it! This one is pretty ominous. The more I look at it, the more I see. Mr. Squash thought this was a poster and bought it. Then he looked closer after he got it home - it is a photograph of a poster!! We're not sure if it's WWI or WWII. This one is not from WWII but purchased for obvious reasons! It's by the famed artist David Lance Gaines. We have another of his, but it isn't war-related. I love it's Art Deco style. I had to sneak the last one in. Mr. Squash's dad was a watch officer in the Navy during WWII. He was at sea when Mr. Squash was born. One if his jobs was to code and decode messages. He received a message that said his son was born, then it finished with "decode no further". This was taken after he got home. The only transportation he could get back home to New Jersey from California was by train. He and his friends pooled money to get a car attached to a train and saw the entire country on their way home! I hope you enjoyed this look back at WWII! You've seen some of the wool pieces I've purchased over the past few months, you've heard me talk about wool, but you haven't seen any of my work! 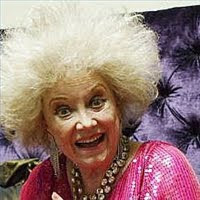 I'm here to quell any rumors that I'm all talk and no show! I really DO work with wool and here is a project I began today. It will be the center applique on Jo Morton's Baby Rose quilt - from the Jo's Little Women series. The applique was supposed to be in 100% cotton, but I thought it would be fun to do it in wool. The background is a brushed cotton homespun. I'll let it sit tonight using Anne's "big tub" method, then begin stitching the edges tomorrow evening. There will be more sneak peeks of the rest of the quilt as I get further along! I hope everyone had a nice Labor Day weekend! Ours was rainy and cold! We even had a bit of thunder today. I think my Bernina 630 protested the rain on Saturday by having a large piece below the thread take-up come loose and nearly fall off! I've never seen a Bernina do this, so I brought out my trusty back-up - another Bernina 153QE - Alex Anderson edition, and took the 630 in for service today. The really good news is we had two showings of the house on Saturday! Actually, one was a realtor doing a walk-thru, but that's really the same thing. We think we might start to get more showings because the $8,000 tax credit will go away Nov 30th. Our realtor said someone needs to be in contract no later than early October to take advantage of the credit. So keep sending that good Karma our way - we can use it! Well ... after a busy week, I'm ready for the long Labor Day weekend - how about you? I plan to do a little sewing and quilting, just a couple of chores, and spend a lot of time with Mr. Squash! The other day Mr. Squash called me from work to say that he had dinner "in the bag" from one of his co-workers, Rocky! Immediately I knew what that meant - Rocky's husband had been out crabbing! Sure enough, she gave us two beautiful cooked and cleaned Dungeness Crabs! Thank you so much, Rocky! What a wonderful dinner we had! Fresh crab, local cantaloupe, tomatoes and sliced bread! I like my crab dipped in a little lite mayo mixed with lots of fresh lemon juice. Mr. Squash prefers his with melted butter! Ah, the joys of the bounty from the Pacific Northwest! I'll be back on Monday or Tuesday with some peeks at what I'm up to in the studio! Enjoy your weekend!! Welcome to Vintage Thingie Thursday! Don't forget to visit all the great contributors over at Colorado Lady! This week I'm showing my vintage Bakelite Tableware. Below is service for 6 which I keep in one of my vintage Shawnee vases. When I first combined households with Mr. Squash, I put all of my things in storage as I was working so much that I didn't have time to sort through it all before moving. The best solution was to have a moving company pack it up and put it in storage until such time we could "sort and combine". Mr. Squash seemed to have everything we both needed, so all I took with me were my clothes. Well....it seemed that the tableware Mr. Squash had was rather - shall we say - inexpensive, and if you weren't careful, you could cut yourself on the sharp edges of a fork handle! So off I went to the antique malls and eBay in search of Amber Bakelite flatware! I had seen it in various magazines and always loved it. The first pieces I managed to find - in two separate purchases - were this matching set of knives, forks and spoons. There are many different patterns in bakelite flatware, with subtle variations and I just couldn't believe I scored a matching set! I even have a second set, but it is currently at the Squash House so we have something other than plastic to eat with when we stay there! One year I was shopping in a local antique mall for something else when I stumbled on this very rare complete set in it's original box of Amber Bakelite Corn Cob holders! We use them frequently! Below is a Bakelite salt and pepper holder with its original glass salt and peppers and a nakpin ring holder. I decided to begin collecting the myriad of fun napking ring holders - birds, fish, elephants, Scottie dogs, etc - and found this one on eBay from a seller in England! Unfortunately they are extremely collectible (translates to VERY expensive) so I stopped here. I keep hoping that someday the prices will drop and I can collect more of them. Here are some serving pieces. Some were gifts, some I purchased. There are more steak knives, but the rest are at the Squash House for when we barbecue steak! Before I go, I want to tell you about the First Friday Freebie beginning tomorrow over at The Painted Quilt! Kaaren is going to offer a free design the first Friday of each month! Go on over and join in the fun!